Throughout the book I found several quotes that I thought would be beneficial for us to consider as we take up our hermeneutical task in light of this glorious truth. I have provided them under topical headings for clarity’s sake. Not all the quotes relate specifically to reading Scripture in light of Christ; some are just general principles that I think are important and hope are helpful. Hermeneutical Perfectionism: Hermeneutical perfectionism is something that is tempting to all of us who believe that truth is knowable. Those who adopt a thought-out and definite position on any matter will have the conviction that they are right. No one holds to a position that they believe is wrong. But thinking that we are right about key issues does not mean that we think we have all the answers in interpreting the Bible, or that our position is infallible. It should not mean that we think we have arrived at the ultimate truth about all matters biblical. In fact, the hermeneutical spiral is a recognition that we must constantly submit our thinking and doing in light of Scripture. The Reformers understood this when they acknowledged that the Reformed church is always reforming (167). Gospel-Centered Hermeneutics: Here we have two related problems affecting evangelical hermeneutics. The one is eisegesis, reading into the text an assumed meaning rather than trying to ascertain how the word is used in the biblical text. The other is allowing the importance of emotions, and an idea of Christian experience, to dull the objectivity of the word. It is in fact a form of reader-response hermeneutics in which the reader, often under the guise of being led by the Spirit, determines the meaning of the text. 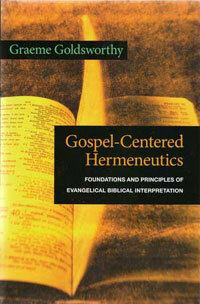 Gospel-centered hermeneutics sees Christ as the determiner of meaning (175-176). The Importance of an Objective Gospel: When the legitimate subjective dimension of our salvation begins to eclipse the historically and spiritually prior objective dimension, we are in trouble (176). Beware of Reactionism: When evangelicals become reactionary, they can often flee unwittingly into the arms of another enemy waiting in the wings (180). Respect for the History of Interpretation (quoting Anthony Thiselton): Although the Reformers believed that the Scriptures stood, as it were, on their own feet rather than being dependent for their use and understanding on the magisterium of the church of the day, Luther and Calvin deeply respected the early patristic traditions (195). Interpretation of History: History cannot be understood without God’s word to interpret it (222). Spiritual Growth: We grow in our Christian lives by being conformed more and more to the image of Jesus, not to the image of Abraham or Moses. These latter, and all the other heroes of the bible, only have exemplary meaning for use because of their respective relationships to Christ (252). Biblical Theology: Biblical Theology is a formal way of determining and describing the theological plan and significance of the whole Bible (259). Theological Starting Point: …from an evangelical point of view, we start with the self-authenticating Christ as he is revealed in the self-authenticating Scriptures (259). Biblical Theology and Preaching: It is to be regretted that biblical theology is so little acknowleded in standard texts on hermeneutics. Yet for preachers and teachers it is probably the most significant part fo the practical hermeneutic task after textual exegesis (262). Application of Scripture: The kind of piety that primarily focuses on questions concerned with what the text says about us and our Christian living lacks Christological depth. This premature desire for immediate guidance ignores the relationship of the text to Christ. If there is one mediator between God and man, the man Christ Jesus (I Tim. 2:5), then to seek understanding of either God or man without recourse to the mediator is a procedure that is Christologically flawed. If we are truly to understand what a text says about ourselves, we must follow the biblical path that leads first to Christ for he defines who and what we are in him (263). Biblical Words (quoting Leland Ryken) It is better to teach each new generation the meaning of the Bible’s technical terms than to eliminate them and produce a generation [of people who] are biblically and theologically illiterate from having suffered long-term exposure to inaccurate and imprecise versions of the Bible. God’s Humble Hermeneutic: The incarnational presence of God was initially to the humble and ‘ordinary’ folk. God made himself known through Jesus to the non-erudite. God’s hermeneutic was the humble son of Mary and Joseph. Hermeneutical theories that forget that simple fact are in danger of isolating the word of God in the heady, and often unsavoury, ivory towers of those who, like the Athenians, love to spend their time ‘in nothing except hearing something new’ (Acts 17:21) (301). Needless to say, these quotes do not exhaust Goldworthy’s book. Nevertheless, I hope that these few excerpts are helpful to you as you think about the great privilege of interpreting the Word of God. May the Lord bless our efforts!